Yoga on York with my fabulous hosts Rae Lynn Stackpoole and Jeff Peltz. It has been an amazing time here which began with a surf in the 60 degree Atlantic Ocean (BRRR!) followed by lots of fresh juicing, Yoga, hiking in the mountains and an intense TRX class with Jeff. Oh yeah, and teaching 8 hours a day in a lovely historic building surrounded by lush green fields (see view from the studio window below). In class today, we talked about the physical and emotional causes of neck pain and the often related feeling of “carrying the weight of the world on our shoulders.” Many of us agreed that we have the tendency to stuff our feelings in an effort to remain in control. We also agreed that the work of Yoga is to help us become comfortable in being more vulnerable and allowing ourselves to feel more, without shame; to allow the emotions buried deep in our tissues to come to the surface and move through us with acceptance and grace. Feeling Vs. Forcing as a key concept of Yoga. Instead of rushing through life, pushing ourselves to the brink of exhaustion, or focusing on outward performance, we are encouraged to slow down and pay attention as we move mindfully in our asana practice. I invite you to come learn, play, feel and explore with me in San Diego this month! I will be teaching my old Wednesday “Happy Back Yoga” class at Prana Yoga Center, 10-11:15 am on July 23 and will be offering a host of workshops including Yoga for the Upper Back, Neck and Shoulders, Scoliosis and Sacroiliac (SI) joint. In 2 weeks, I leave Israel for a long trip to the U.S. I will be spending time on both the East and West coast spreading my “Yoga for a Happy Back” Trainings that I have developed intensively over the last year. It is amazing to me that it has almost been a year since moving across the world to my new home in Herzliya, Israel. I remember a moment when I was facing the ocean, surfboard in hand, in La Jolla. It was right after I made the decision to move to Israel and a feeling of panic overtook me. What was I doing leaving a perfectly good life to follow nothing but a feeling inside? Was I crazy? What if I was making a huge mistake? 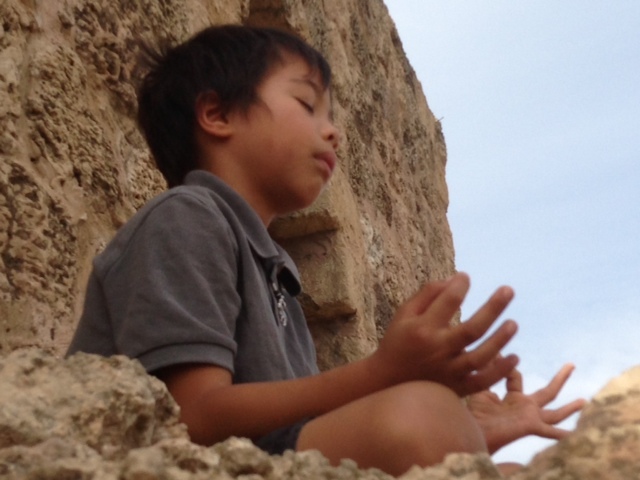 If my Yoga studies have taught me anything, it was to listen to that still, quiet voice in my heart. But once I did, a host of new feelings of fear came crashing in. I grabbed my board and dove into the ocean, knowing that somehow the big blue would contain my fears. And I was right. When I emerged, after dancing with the waves of the powerful and unreliable sea, I felt more at ease with the impending unknown. I guess I am living an unusual life. I have a clinic in California, but I live in Israel. I travel back and forth to teach and see friends and family while building a new community in the Middle East. I go to Hebrew class where I read at a first grade level. Tahina and Hummus are as essential to my life now as water and air. Some days I wonder if I would rather have a more ‘normal’ life. There are days when I wish I was not a divorced single mother, making my way in a new country with no guarantees. I sometimes feel scared, sad,and even lonely. But then, I teach my Yoga class or a group of Yoga teachers and in an instant, I can feel the life coursing through my veins. I know I am doing what I am meant to, even if it may be a bit unusual by society’s standards. If I can remain present, I can tap into that deeper knowing that I am in the right place for me, right now. The truth is, it is not about anything on the outside. Begin happy is being peaceful in your heart, no matter what your life situation is at this very moment. This is what we will be exploring together in my trainings this summer – along with the usual alignment, therapeutics, anatomy & physiology. The key to a “Happy Back” is a peaceful core, free from holding onto a false sense of control or gripping in life. Are you willing to dive in with me and see if we can heal this world one ache at a time? Want to do something ‘unusual’? Invest in your career, your life, yourself. As some of you may have heard, my father passed away on March 22 in Montreal after a struggling with a long history of heart disease and diabetes. I flew to my hometown last minute to be there along with my 4 siblings who came together from all over the globe. It has been quite an intense process so far, but also a good one. In the jewish tradition, we sit “shiva’ which means seven – for the seven days of mourning that children observe for their parents. In these seven days, we sit on the floor, we do not shower, do not leave the house and are not suppose to even serve ourselves to eat. Visitors from the past are invited to come and sit with us. We are invited to talk about the deceased and are forced to deal with the discomfort of sitting with our family and all the different personalities that we have grown up with. Going through this process makes a lot of sense to me. It was the first time in over 14 years that all my siblings have been together and were not chasing after children or running around town entertaining one another. We were forced to sit together day after day and talk. In this process, we became closer. We looked at old photos, talked about the difficulties we had with our parents, cried and laughed and held hands working on forgiving each other and my father for all of our limitations. Without this ritual, we would have all come for the funeral and then gone our separate ways, holding onto the grief, sorrow and pain which would inevitably rise up at some point either emotionally or physically. That is not to say that we are done grieving. It is a process that I see will continue in many different stages and forms. But at least we had the opportunity to deal with the initial stages together. This is a time I will cherish forever. In Yoga, we practice asana (postures) in order to prepare our bodies and our minds for the task of sitting still. Sitting quietly and observing our thoughts for a few minutes is often A LOT harder than a vigorous 2 hour Yoga practice (those of you who have a meditation practice know what I am talking about!). When we sit still, we have to deal with all the uncomfortable feelings and thoughts that arise and have the fortitude to avoid running away. This is the real work of Yoga. In this process, we invite all our shadows to the surface and observe them knowing that they are not us, they are simply part of our conditioning. We do not have hope of changing our patterns if we are not wiling to take a long, close look at what is really driving us. This is the key in becoming less reactive and cultivating more peace and harmony with yourself and others. So sit still a little bit every day. And just listen. Quiet the noise so you can hear the whisper of your heart. Spring is here as the last of the much needed rains wash through Israel. Soon the heat will come, along with the jellyfish in the Mediterranean Sea, crowds at the beach, fresh figs, festivals in the desert and my trip back to the US which is approaching (June 30-Aug. 21). Some days it is hard to believe I have been here for 8 months already and other days it feels like it has been years. In this short time, I feel blessed to have found a community of students, patients and friends in Ra’anana, taught 3 anatomy courses for Yoga teachers in Jerusalem and Mikhmoret and am about to graduate my first Yoga for a Happy Back Certification class (of 14 women) in Israel. 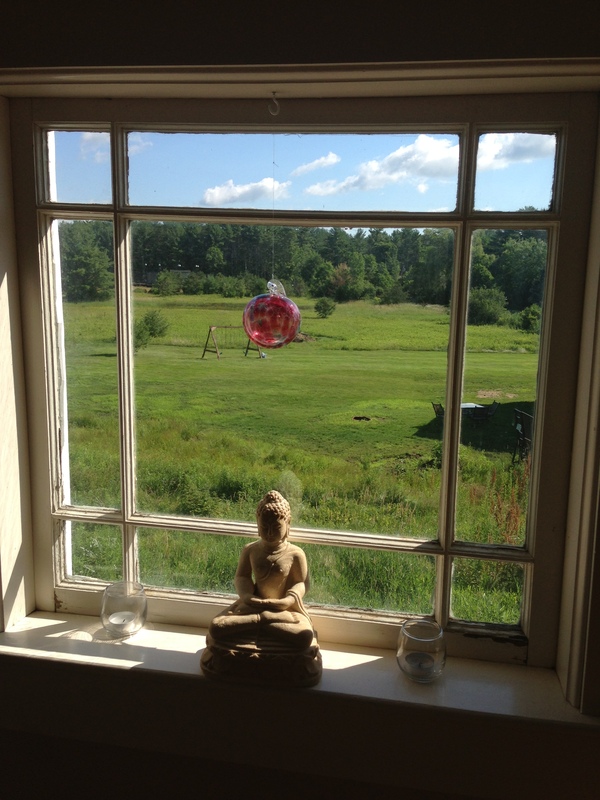 The next Yoga for a Happy Back Certification programs will be in Maine (5 day intensive) and in San Diego (10 day intensive) this July (please read on for more details). I feel so blessed to have had so much opportunity and openness to my work and the work of Yoga Therapy at large. I recently had the chance to travel to Bethlehem to visit with a fellow Yogini I met in a workshop here. She runs the only Yoga studio in Bethlehem and up until this year was the only Yoga teacher in the area. She showed me around Bethlehem, where I ate the best hummus and falafel EVER, shopped in the old city and walked through the Church of Nativity, and we talked about the need for more Palestinian Yoga teachers. Political beliefs aside, it became clear to me after the visit, how violence not only hurts the victims, but also the perpetrators themselves. I hope to visit more often and help with training more Yoga teachers where they are truly needed. Where people can live together and appreciate their differences with honor and respect. Where peace prevails over aggression. Where everyone can connect with their own Divine spark without fear. Enjoy the photos below from my day in Bethlehem. 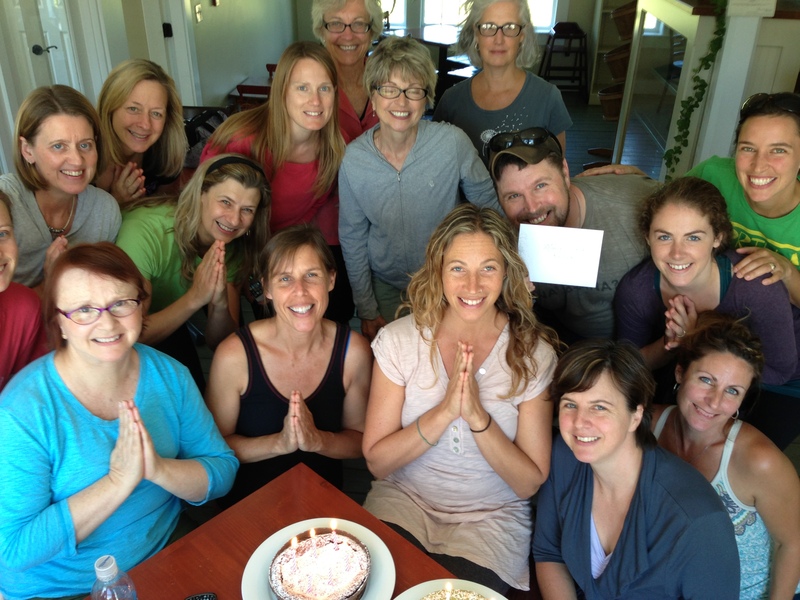 Earlybird deadline to save $150 for San Diego training is coming up on April 1, 2014 – so go to www.prana-yoga.com to register now for the 10 day Yoga for a Happy Back Certification Intensive July 18-27, 2014. It is Sunday morning in Israel – which is like Monday morning in the US – kids going back to school, the rush of morning traffic, lines in the local coffee shops for a “café Hafuch”. I am in line at the post office (again), to pick up a package along with a hundred others who are paying their bills, sending mail and getting their driver’s licenses & registration. I ordered a model of a spine about 2 months ago and I am still waiting for it to arrive. By the time it does, if it does, my anatomy course will be over. Like socks in the wash, it seems that packages just disappear. You never know what you are going to get and when. I have Hebrew class today but I want to go to the Sea. Instead, compelled to write and unable to wait, I walk to a nearby café with my laptop, itching to get my thoughts onto the page. It has been quite an interesting weekend and I am not quite sure what to make of it. Part of me wants to smile and part wants to cry. I intentionally threw myself into a weekend with “charedim” – the ultraorthodox Jewish sect of individuals – in Ramat Beit Shemesh, an area where my brother lives, an area where everyone looks the same to me in black and white. This is not a new experience for me. In fact, this area is quite familiar. It is reminiscent of my childhood school where I spent most of my young life in Montreal. It wasn’t necessarily a bad experience at the time, but it seems that I have spent most of my adult life trying to recover or make sense of the small and consistent feelings of fear, inadequacy, shame, oppression and inherent racism that I feel I was exposed to on a daily basis, in the name of God. And here I was, back in the thick of it all. My sister in law’s brother is getting married and I was invited to join the festivities at the local synagogue. It was a good opportunity for me to connect with him, who I love dearly, and his extended family in Israel, which has become my new home. But as I walked up to the synagogue in the only black dress I own that covers my knees and elbows, feelings of anxiety and mild nausea began to surface. My hosts for the weekend were wonderful and as the husband saw my apprehension, he invited me back in the house for a shot of whiskey, to take the edge off. Thank God for small miracles and acts of kindness. But even with this little bit of help, I could not escape the feeling that somehow my life has come full circle and I had nowhere left to hide. It turned out, unbeknownst to me, that these apparent strangers, who invited me to stay in their home for the weekend had roots in Montreal as well. I met the woman in a Yoga teacher training. She was a student of mine, an interesting woman who had gone from secular life to religious life to Yoga life and we connected. Over the course of the weekend, it became apparent to both of us that our lives were strangely interconnected on many fronts. As we talked, layers of the past unfolded and secrets that I thought I had buried years ago came to light. Her husband knew of my father’s arrest and his accomplices. He knew of the scandal that my family endured when the headline “ Local Rabbi Busted for Selling Heroin to a Cop” made its appearance on the front page of the Montreal Gazette, changing the course of my life in an instant. Just speaking about this experience, here for the first time in my new home, made me realize that I have come to a place, by my own choice, to face the past. It was inevitable that moving here, to a Jewish state, near my family, would entail having to face aspects of my upbringing that I was truly able to avoid in California. (The beauty of moving to San Diego from Montreal, was that I was able to take a break from expectations and judgments about who I was and start again. Living in a young town, where most people moved to from somewhere else, provided a much-welcomed feeling of anonymity. We were all starting new, in a beautiful town with beautiful people and sometimes the hardest decision was whether to go for a walk on the beach or surf. So why put myself back in the world that spit me out? It’s a question that I have asked myself many times since moving here. I am not sure I have the exact answer, only that I know in my heart that I will not ever be at peace if I keep running away. A popular Yoga teacher once told me years ago at a workshop I attended on Yoga philosophy, that no matter what, I need to go back to my roots. That I cannot use Yoga as an escape but only as a complement to what my inner fabric already was. I was not ready at the time to hear those words and I put them away for later reference. But they never left my consciousness, as I knew he was right. This weekend opened up the realization that I have nowhere left to hide, nowhere left to run to. For years it was travel, then exercise, then work, then lovers, even Yoga that helped me forget about the pain and loss and grief that lived in my heart. For the death of my older sister who we never talked about, for the love and approval I never felt, for the lack of touch from an emotionally absent mother and for the rejection and betrayal of a revered father. But at some point, there is nowhere, no person, no drug left to fill the emptiness. When we open the door to awareness, we invite the uncomfortable to come up and we have the choice, the opportunity, to sit with it, to face it, or to stuff it back down. After all these years of practicing, studying and teaching Yoga (which I know is still just the beginning), I am starting to see that Yoga has been the one thing that has prepared my nervous system to contain all this and to begin to heal. It is the one truth I can keep coming back to. It is being a part of this discipline that has encouraged me to grow beyond my limited beliefs and to recognize that often my own feelings can be deceptive; that my own desires are not always in my best interest. So here I am. Here in this country where I feel at home and also like a stranger. Where there is so much magic, beauty, hatred, disaster and kindness at its core. Where paradox is at every corner. Where there is nowhere left to hide. Can I dare to be happy with what is? Living in a new culture is always an interesting experience but the longer I am here, the more I realize how deeply our social upbringing affects our beliefs and our behavior. Growing up in Canada and then moving to the US was an adjustment, but it pales in comparison to the constant mental and emotional shifting I need to make here in Israel. People do not leave voice messages here. They just call you and hang up, then they expect you to call them back even if you don’t know who they are. People in customer service (e.g. the bank, post office, schools) will often answer the phone and help someone else while you are standing there right in front of them. Other people will actually come right up to the counter and make a request while you are there talking with the personnel. This is totally acceptable. It is completely acceptable to park on the sidewalk (and in the bike lane!) while dropping something off for a little while. Cars also park in either direction on both sides of the street. Children here have more freedom. Most kids 7 and over walk to school by themselves. After 9, most kids go home from school by themselves with a key and make themselves lunch. People here do not plan way ahead like we do in the U.S. Especially with Yoga trainings and classes, most sign ups happen the week before the program so you never know until last minute if you will have a good turnout or not. People will never turn down an opportunity to have coffee with a friend. People go out at night with their children here all the time. They are more relaxed about schedules and bed times. It is perfectly acceptable to begin talking to anyone, anywhere, at any time. Individuals go out of their way to help you. I saw a funny skit about someone who asked a woman in Israel for directions, and she ran next to the car the whole way explaining how to get there! It is a bit absurd but could actually happen here. People will give you their opinion about everything here, whether you ask them or not! It is considered cool to spit out hundreds of sunflower seed shells onto the sidewalk, especially when watching soccer games. Ok, I could go on, but you get the point. It is a good lesson in awareness that we may be accustomed to one way of life, but there are others with a totally different way of thinking. Once we realize this, we can separate from our limited beliefs a little bit more and see things from another’s perspective. You don’t have to move to a foreign country to experience this shift. It is also possible on your Yoga mat. The focus and discipline that a regular practice requires of us starts to train our mind so that we begin to detach from our Ego and see the common thread that exists in all humanity. It is there. We really are all the same, minus a few habits here and there. We all laugh and cry, we all struggle with the inconsistency that life brings, we all love our children and families, we all hope for contentment and peace of mind. Wishing you a wonderful holiday season – and a beautiful New Year filled with joy, prosperity and an open mind and heart. I will be back In San Diego this summer and will be teaching some exciting workshops…See below! I hope to see you all when I return in July. It’s crazy how time flies!